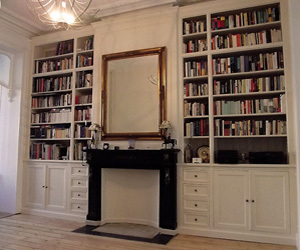 In a room characterised by a ceiling height of 3m60, panels, cornice and central chimney, Noir Ebène designed a bookcase matching perfectly with the existing elements, including the cornice of this room. 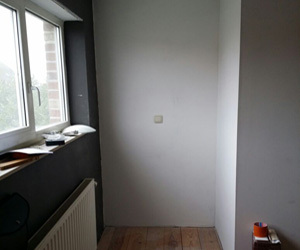 The specifity of this Small room is a very low ceiling height of 1m99. The challenge to realise an ensemble 'bookcase-bench-heater screen' in this room without overloading it, is achieved several weeks later. 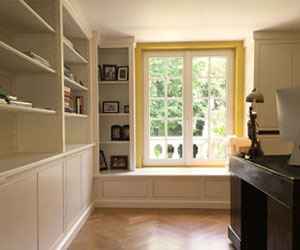 Doors and drawers are fitted with "Push-Pull" opening system, giving the bookcase lines even purer. 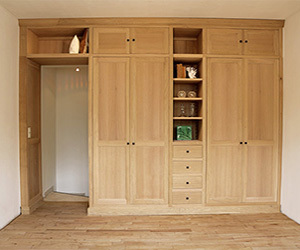 In this spacious bedroom with regular ceiling height, Noir Ebène designed a oak wardrobe that fits the wall of this bedroom up to the ceiling. 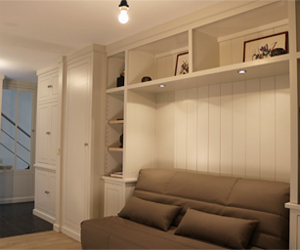 Because of aesthetical reason and in order to save space, a sliding door has been perfectly integrated to the wardrobe giving access to the main stairs of the house. In a little niche of this bedroom, the self-supporting desk designed by Noir Ebène was basically aimed to save the wasted space. 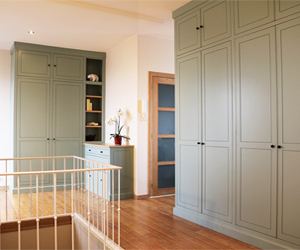 The chosen color gives to these two wardrobes an original and warm look. 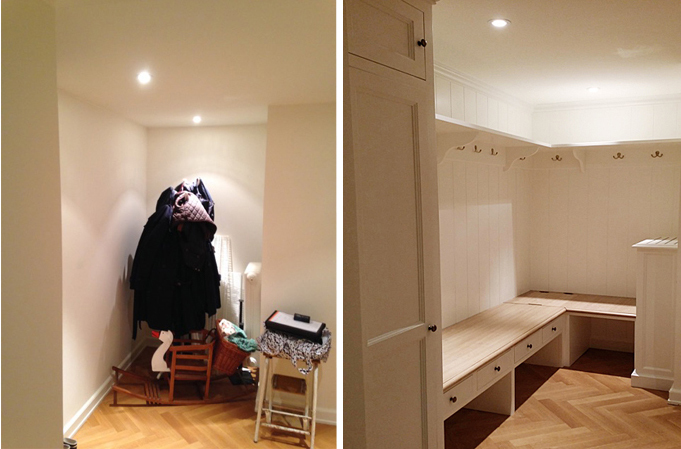 The big bedroom is now brightened up with qualitative furnitures allowing a huge storage capacity. 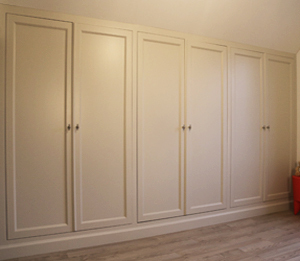 This wardrobe matches perfectly with the sloping ceiling of this room with millimetre accuracy. The storage space that was wasted is now entirely optimized. 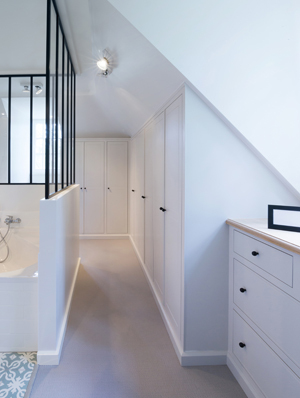 This wardrobe under slope is cleverly designed but still with a sober style and color. 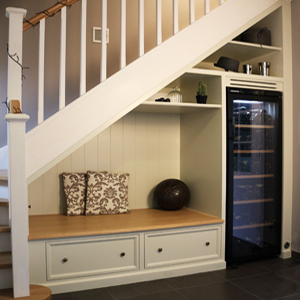 The wasted space under the stairs is fully furnished, integrating the bench and the wine cellar. 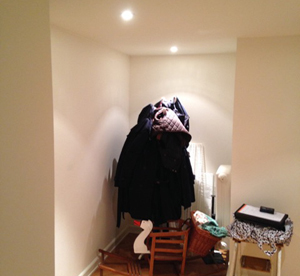 Large area with unusual spaces coming from the uniting of two rooms through the breaking down of a wall. 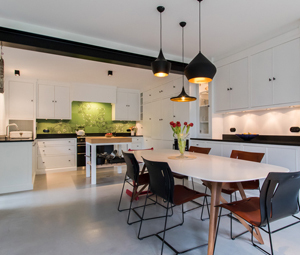 The kitchen designed by Noir Ebène offers refined lines and is associated to a working surface in reconstituted Belgian blue stone. No suspended elements but large storage spaces along the main wall. Untapped space, converted in a charming guest bedroom. This wardrobe-Bookcase combination enables the integration of the sofa-bed. The room is closed with a sliding glass door. 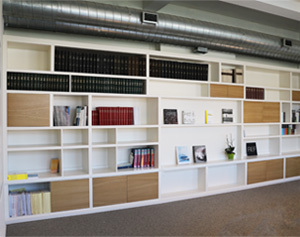 In this meeting room, the objective was to integrate a modern bookcase that would come under the ventilation shaft and that would hide the locked door. The bookcase is made with different depths. 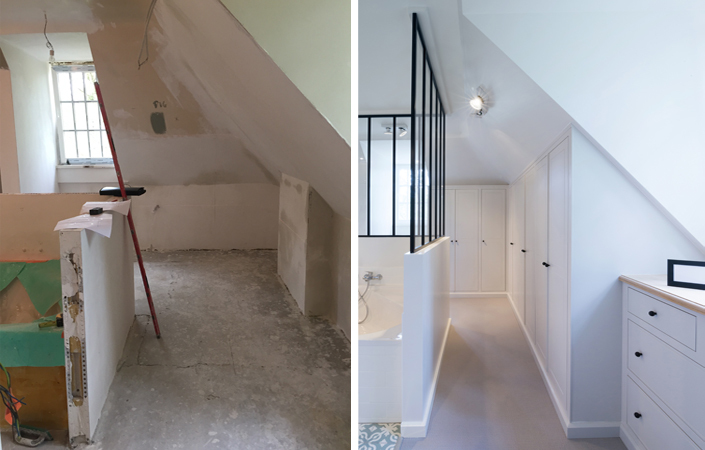 Sloping ceiling, many constraints and a ceiling height of 4m. 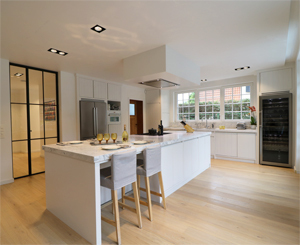 Creating a harmonious kitchen in this complex room was a big challenge that only few could have completed. 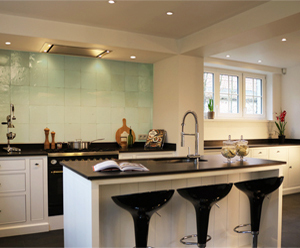 Broad kitchen with refined style and an entire wall covered with cupboards. The Noir Ebene signature is again represented by the combination of the agrigento white for the cupboards and the black granit as working surface They are associated with green zelliges which gives somehow a warmth touch to this beautiful kitchen. 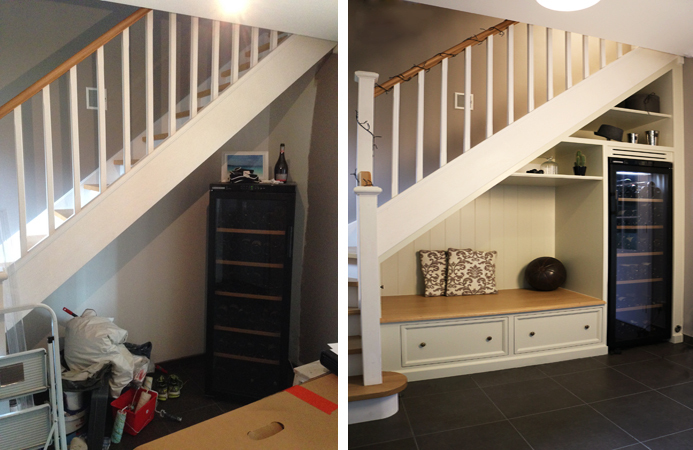 The purpose was here to combine an exhibition cupboard and a bookcase offering a great space for the television. This bespoken creation is perfectly integrated. 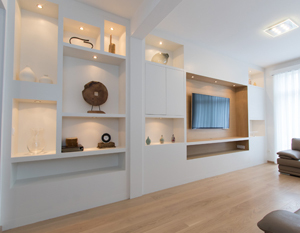 The TV space is made from natural oak and breaks somehow the modernity of this realisation. It has finally been decided to go for a central island with important dimensions for this project since it must represent the major element of the kitchen. Among others, cooking and eating corner are included in this island. Plus, the choice of a Carrare marble with 6cm of thickness makes the realisation more modern and offers us a stunning scenery. For once, natural oak has been chosen for this kitchen giving it a genuine identity. 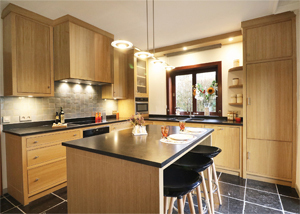 The lines are however refined and confers to this kitchen a modern design. The zelliges and the working surface in granit complete the beautitul association of materials. Realisation of a fonctionnal wardrobe with pure lines matching the rest of the suite parentale which is quite contemporary. 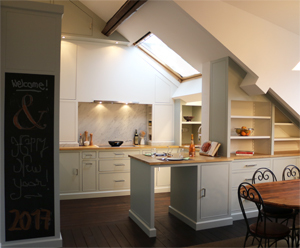 The integration is perfect despite different ceilings, rounded corners and chimney.